On 25 March 2012, the Senegalese people elected a new president in a highly charged second round election marred by violence. It was not the first time Senegal had experienced serious electoral clashes. Twice before, in 1988 and 1993, - the country bore witness to heated riots and upheaval. But this time round, the fear of uncontainable violence was much higher given the level of issues at stakes – one of which was President Wade’s much debated candidacy for a third term in office. The sweeping victory of the coalition supporting opposition candidate, Macky Sall, who won 65.80% of the votes compared to 34.20% for contender and outgoing President Abdoulaye Wade, is testimony to the popular clamor for change and vitality of Senegal’s democracy. Throughout the entire electoral process, the youths of Senegal put up a remarkable fight using, as their weapons, the hip hop movement and social media. Both tools functioned as their primary means of encouraging protest and garnering popular support, both in the lead-up and during the election period. The unprecedented mobilization and engagement, by this particular age group, is indicative of a major shift in youth engagement in political affairs in Senegal. While the main opposition parties, gathered under the coalition ‘Benno Siggil Senegal' (BSS) wasted much time discussing presidential nominees amidst the controversy over President Wade’s candidacy, the youths were busy organizing themselves in quite a different fashion. In hindsight, these young people definitely had an agenda of their own – one vastly different from the political parties who were merely interested in assuming power. The youths were not running for positions. They were looking for change – massive changes in their living conditions, and they went about this pursuit ardently and methodically, mobilizing vast numbers and educating voters on how to remove Wade, the very person responsible for the countless social and economic difficulties plaguing their country. Back in 2000, Wade was elected on the hope of a better life for Senegalese. But soon enough the government’s plans derailed. Wade failed to tackle the challenges. He did not keep his campaign promises to provide jobs for the country’s predominantly youth population nor did he help improve the living conditions of Senegalese people in general. Through social media and hip hop, the youth rallied together and ended up leaving their own indelible mark in the 2012 elections. The hip hop movement was particularly powerful in this regard. The hip hop trend started in Senegal in the early 1990s, first as a mimic of the African American hip hop movement before taking on its own identity some years later. During the recent elections it transformed into a guiding light for this revolution. And yes, it really was a revolution. 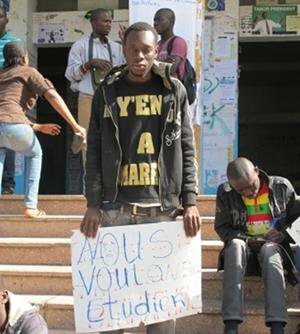 A group of friends made up of young journalists and rap musicians called ‘Keur Gui’ created the Y’en A Marre (Enough is Enough) movement, which led the revolution. These young men stem from Kaolack in the centre west of the country, bordering The Gambia and one of the country’s poorest and most neglected regions. The youth from the Y’en A Marre group, like many other youths from other low-income suburbs of Dakar, commonly referred to as the ‘banlieue’, were badly affected by the social crisis in Senegal marked by a major increase in the price of basic commodities. This crisis exacerbated during Wade’s second term in office and precipitated the old man’s gradual decline and eventual fall from power. Just why and how these youth groups became engaged in the 2012 elections is as understandable as it is commendable. And their support among many Senegalese was indicative of just how “fed up” a vast majority of people had become with the gross failures of Wade’s administration. Popular support for “Yen a Marre” really started gathering steam at a public rally on 19 March 2011. For Senegalese this is a historic date, as eleven years earlier it heralded in a momentous occasion: Senegal’s first regime change and Wade’s inaugural rise to power. From this day onwards, Y’en A Marre managed to keep their momentum going. They mobilized young people across the country and spoke about keys issues of civic engagement – voter registration, environmental consciousness, civic duties and rights… They took these issues and packaged them under the concept of “NTS” -Nouveau Type de Senegalais, the “New Type of Senegalese”. This became a galvanizing theme throughout their campaign and a key way to encourage mass participation in the elections, especially among youths. To ensure their messages were heard throughout the country, they created ‘Y’en A Marre Esprits’ - 'Enough is Enough' . This concept encouraged anyone who shared their own vision of NTS and to continue spreading the word in their own communities. This highly adaptable structure, combined with the strategic timing of their efforts, ensured the Yen a Marre movement would solidify its place in Senegal’s history. So how did they actually do this? To answer this question, it’s worth looking more closely at the very process of the Yen a Marre pursuit. The first phase of their struggle was to get youths, enmasse, to register for voting. Having unsuccessfully tried, on two occasions, to get Senegalese officials to extend the voter registration period, the Yen a marristes had to take matters into their own hands. They had to ensure not only that people registered, but also, in their second phase of activities, that these registered voters actually picked up their voter cards. The third phase was to get people out on Election Day – a vitally important part of their whole mission and one which, when push came to shove, depended on the integrity of Senegalese people to actually put all their words into useful action. The music from Yen a Marre’s rappers also played an interesting and powerful role in garnering youth participation. Famous singles such as ‘faux-pas forcer’ (bad move) and ‘Dogali’ (finish off) were big hits during the election campaign. The song ‘faux-pas forcer’, is a play on words, using the written word “faux”, which means “fake”, as a warning against the falsity of Wade’s candidacy. The song also reminded listeners that his bid for re-election is a “bad move”, and one that poses great danger to democracy, peace and stability in Senegal. The main reasons why Y’en A Marre has been so successful is due, primarily, to how it structured its independence and its (more or less) clearly-defined goals. The group does not have one single head that is in charge, but a coordinator who can be replaced at any time. The group has also a good mix of youths from all trades: journalists, rap musicians, engineers, etc. The current coordinator of the movement is a journalist. Furthermore, the group has been remarkably successful at distancing itself from politicians. This is in itself admirable, if not quite unusual in present day Senegal. These youths are also well-educated and have maintained a clear civic discourse – this is in stark contrast to the traditional political discourse that is often filled with lengthy parlance and unkept promises. Aside from the Yen a Marre movement, another aspect that had its noteworthy debut and bore considerable impact during the 2012 elections is the rise of Web 2.0. The tremendous popularity of the internet was achieved in large part due to the efforts of the Association of Senegalese bloggers. Consisting of mostly young people, the Association created a web platform called Sunu2012. This proved to be a viable source of information for internet users and journalists across the country, and around the world. The primary objective of the initiative, according to its founders, was to sensitize citizens on the candidates and their programs. Candidates were given the opportunity to create their own pages and publish their programs through this platform. Meanwhile, citizens could comment and debate on each one of these programs. In the same way that mobile phones played a vital role in the 2000 elections, the Sunu2012 web platform published elections results live, as soon as they became available. This made it possible for people, the world over, to follow results in real time. The Senegalese media also relied on results published by Sunu2012, and local TV stations took good advantage of this technology. The platform was able to use the force of popular social networks, such as Facebook and Twitter, to receive information from users who were on the ground and relaying accounts of voting, as well as results coming in from polling stations clear across Senegal. While there may not be any scientific evidence to measure the young people’s impact in the outcome of Senegal’s 2012 elections, nor any studies to show how Web 2.0 played a role, it is clear that the force of the young people, through their voices and action, has been a strong and significant ally in ensuring a relatively free and fair presidential outcome. The 2012 elections signaled the emergence of a youth consciousness in the country, and perhaps even a shift in political participation more generally. Both groups remain adamant that they will keep a close eye on the new government’s regime, and continue to act as watchdogs; ensuring democratic values will continue to build and solidify firm foundations in Senegal.